PLANO, TX--(Marketwire - January 25, 2011) - Lineage Power Corporation, a Gores Group company and the first name in power, today introduced the Barracuda family of digitally controlled, fully-regulated bus converters for DC-DC Intermediate Bus Architectures. The cost-effective, high-efficiency Lineage Power® Barracuda™ series delivers digital power communication and control in standards-based eighth-brick and quarter-brick DOSA footprints. Power design engineers can deploy the new Barracuda modules in existing power designs as DOSA-compliant, drop-in upgrades for unregulated and semi-regulated bus converters challenged by recent industry-wide intellectual property issues. As part of the Lineage Power Total Efficiency™ architecture, the new Barracuda modules deliver efficiency of 96 percent and are priced comparable to current semi-regulated bus converters to encourage rapid adoption in new and existing product designs. "The Barracuda digital bus converters give global OEMs the confidence to leverage the energy efficiency benefits of digital power control with cost-effective multi-sourcing options for supply chain efficiency," said Niklas Fallgren, vice president and general manager of Lineage Power's Embedded OEM division. "Our backwards-compatible, standards-based digital solutions enable our OEM customers to power innovation in their new product designs, lower costs, reduce risks, and meet their customers' needs for today's accelerated design cycle." The Barracuda QBVW series is a digitally controlled drop-in alternative for unregulated and semi-regulated bus converter products. The PMBus™ Rev.1.1-compliant Barracuda QBDW series features built-in I2C digital communications to enable design engineers to leverage the benefits of both digital communication and control. Both members of the Barracuda family are designed to provide a 9.6-12 Vdc intermediate bus voltage after which multiple, low voltage rails are generated using additional Point of Load (POL) converters such as DLynx™. This architecture is designed to power silicon devices such as processors and memory devices on circuit boards using POL converters. Barracuda converters can also be utilized for other applications requiring a fully-regulated output voltage in distributed power architectures deployed in networking, Power over Ethernet (PoE), computing and data storage devices. New synchronization features, active load sharing and differential remote sense are combined with a digital PMBus interface that supports a wide range of commands to both control and monitor the Barracuda modules with a full range of protections and warnings, digital on/off, trim, margin, power good, rise time adjustment, and input under voltage lockout. Lineage Power Barracuda samples are available now. Pricing starts under $47 per unit for OEM quantities. 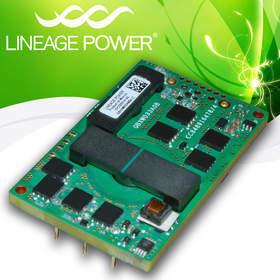 For more information please visit oem.lineagepower.com or call 888-LINEAGE or +1 972 244 WATT. Lineage Power, a Gores Group company, traces our nearly 100 year heritage of innovation to Bell Labs and Western Electric. We deliver reliable and intelligent power conversion solutions for cloud computing and mobile internet infrastructure with energy-efficient AC-DC power supplies, DC-DC circuit board mounted power modules, telecom energy systems, DC datacenters, and custom power products backed by local field expertise in 25+ locations worldwide. Designed for decades of non-stop operation, the high-availability DC power conversion solutions enable voice, video and data communications while assuring investment protection, total system efficiency, and significantly reduced total cost of ownership. Our customers include leading U.S. telecom service providers, such as AT&T, Verizon Wireless and Verizon, and leading global OEMs, such as Alcatel-Lucent, Cisco, Ericsson, Hewlett Packard, Huawei, Juniper Networks and Oracle. More information about Lineage hardware, software, services and training is available at www.lineagepower.com. The Gores Group LLC is a private equity firm focused on acquiring controlling interests in mature and growing businesses which can benefit from the firm's operating experience and flexible capital base. The firm combines the operational expertise and detailed due diligence capabilities of a strategic buyer with the seasoned M&A team of a traditional financial buyer. The Gores Group, LLC, which was founded in 1987 by Alec E. Gores, has become a leading investor having demonstrated over time a reliable track record of creating substantial value in its portfolio companies alongside management. The firm's current private equity funds have committed equity capital of over $3 billion. Headquartered in Los Angeles, The Gores Group, LLC maintains offices in Boulder, CO, and London. For more information, please visit www.gores.com. The new Lineage Power Barracuda series of fully regulated bus converters for DC-DC Intermediate Bus Architectures.